District-inspired artwork and many offering stunning views of the city or the Hudson River. available on the patio in front of and behind the hotel. the convenient onsite 24-hour Made Market Pantry. equipment are also available, as is a fully-equipped 24-hour business center. unique events through the Hilton Honors auction platform. New York, New York 10018.
owned by McSam Hotel Group and managed by Crescent Hotel & Resorts. Hilton (NYSE: HLT) is a leading global hospitality company, with a portfolio of 14 world-class brands comprising more than 4,900 properties with over 800,000 rooms in 104 countries and territories. Hilton is dedicated to fulfilling its mission to be the world’s most hospitable company by delivering exceptional experiences – every hotel, every guest, every time. 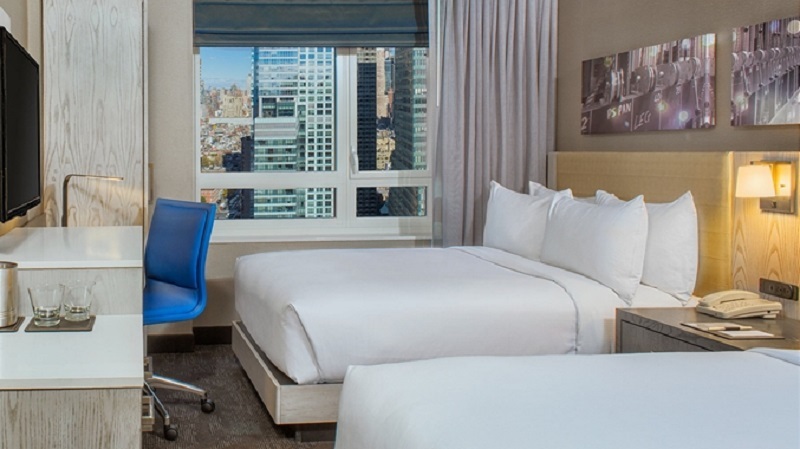 The company's portfolio includes Hilton Hotels & Resorts, Waldorf Astoria Hotels & Resorts, Conrad Hotels & Resorts, Canopy by Hilton, Curio - A Collection by Hilton, DoubleTree by Hilton, Tapestry Collection by Hilton, Embassy Suites by Hilton, Hilton Garden Inn, Hampton by Hilton, Tru by Hilton, Homewood Suites by Hilton, Home2 Suites by Hilton and Hilton Grand Vacations. The company also manages an award-winning customer loyalty program, Hilton Honors. Hilton Honors members who book directly through preferred Hilton channels have access to instant benefits, including a flexible payment slider that allows members to choose exactly how many Points to combine with cash, an exclusive member discount that can’t be found anywhere else and free standard Wi-Fi. Visit newsroom.hilton.com for more information and connect with Hilton on Facebook, Twitter, LinkedIn, Instagram and YouTube.